(Newser) – The view of a planet that’s 746 million miles away just got a little clearer, thanks to a historic first by NASA's Cassini probe. 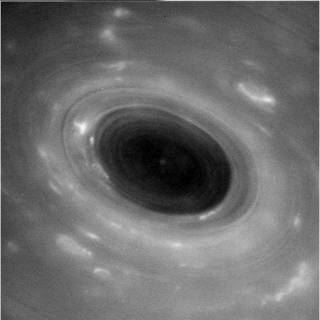 The spacecraft completed a dive between Saturn and its rings, capturing data and images of the planet never seen before. The first photos began pouring into the Deep Space Network Goldstone Complex in the Mojave desert Thursday morning after a brief lapse in communication while the spacecraft’s 13-foot antennae was being used as a deflector shield, according to NPR. NASA says that Cassini, which has been in space for 20 years, made the historic dive within the 1,500-mile-wide gap between Saturn’s atmosphere and its icy rings. CNN reports that the mission may help scientists understand how giant planets evolve as well Saturn’s speed of rotation, gravity, and magnetic fields. This question might be considered irrelevant, but is Cassini from the U.S. or Italy? They need to send that probe near end of life down the pole area of Saturn to get as much info on it as possible. The magneto sphere around Saturn should help in gathering signals from the craft as it descends. If it's an unmanned craft what the hell is so "daring"? Like I went on a daring mission on my Xbox last night.